​that have met the $100 (10 hours) volunteer reduction!! Time is running out! We only have 9 events left!! ​is our primary fundraising tool?! By staffing and managing the concession stand for most indoor sporting events, we have been able to save money and purchase new equipment, instruments, marching band uniforms, and a trailer in the past few years. - When our students perform in the middle school and high school pep bands, many of them will stay after school. That makes for a VERY long day! We decided about 4 years ago to feed the high school pep band after half time. They receive an entree, a snack, and a drink for free from the concession stand. - This will be the 3rd year that we will feed our EMS pep band before they perform. Sometimes band parents prepare sandwiches, sometimes we buy pizza or chicken strips, etc. Plus the students normally get a drink and a snack. - We are able to keep our marching band fees lower than most of the other marching bands in our area due to the profits we receive from our concession stand. Managing indoor concessions is a daunting task! We finished Ladies Volleyball in the fall (18 shifts with 3 people per shift) and we are in the middle of our busiest season. Our winter sports season (Mens & Ladies Basketball plus Wrestling) runs from November 28 through February 5 this year (approximately 47 shifts with 4-5 people PER SHIFT). Finally we have our Mens Volleyball season which will be approximately 16 shifts with 2 people per shift. -In addition to worrying about staffing, don't forget we have to purchase supplies, track inventory, and make sure eveyrone is up to date on training. What does volunteering in the concession stand get you besides a warm feeling knowing that you are helping the band to grow and improve? You/your student are able to earn a fee reduction for a few of our groups (Percussion Ensemble, Winterguard, Marching Band/Colorguard), or you can receive raffle tickets for our 4th Annual Basket Raffle Extravaganza in May (for those of you who's student is a senior, doesn't participate in any of those groups, or you have reached your maximum amount in any/all the groups). Please feel free to contact an Executive Board Member if you have questions, need training, want to help with feeding our students, or need more information about all things band/guard. Easy Ways to Support our bands! Log into/set up a Kroger Rewards account. Go to your account summary, Find Community Rewards, and click re-enroll/enroll Edgewood Band Boosters (#81583). Now the bands receive a percentage of your purchases!!! The next time you shop, let the cashier know you want to shop to reward Edgewood HS Band Boosters (#2181093). We accumulate points that can be cashed in as actual dollars! Go to smile.amazon.com. On the upper, left screen (just below the search box), there is a “Supporting” drop down. If you type in and select Edgewood Band Boosters Association, a portion of every sale made through AmazonSmile will go to the bands! Facebook: Search for and join the closed group Edgewood Bands (Parents, Musicians, Families, Friends). Remind: This is our cell phone notification system. Sign up only for the specific groups you need to receive info and messages about! Groupme: Do you have questions while you're working in the Concession Stand? This is a quick way to get in touch with an Exec Board member if one isn't working during your shift! 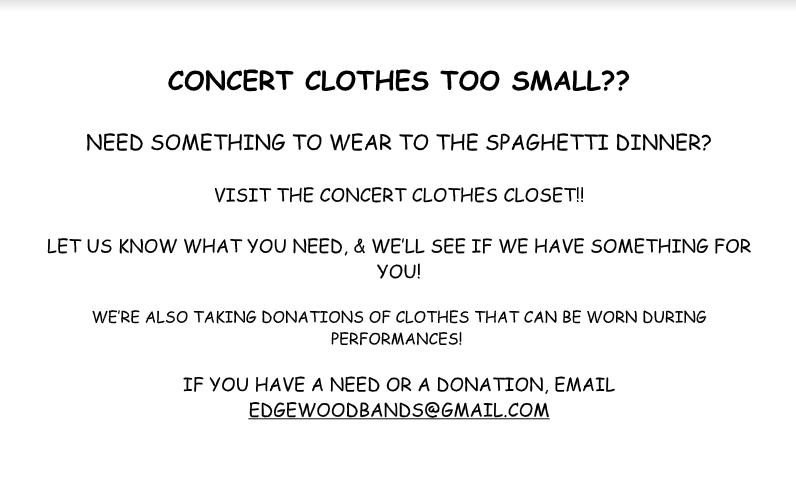 If you are a parent/guardian/grandparent of a current band or guard student within ECSD, you are already considered an Edgewood Band Booster! If you are a member of the community interested in the progress and development of the instrumental music program(s) and/or their affiliated groups within ECSD, you are eligible to be a member of the Edgewood Band Boosters Association. Booster members are welcome to all open meetings (the second Tuesday of almost every month (from August-April, normally at 7pm). We normally try to keep the meetings to an hour. The atmosphere is relaxed. We would love to hear your ideas! Another perk: after attending 2 meetings, you can vote on topics. Please feel free to join us - we'd love to see you there!! 2019 handbook will be coming out soon!